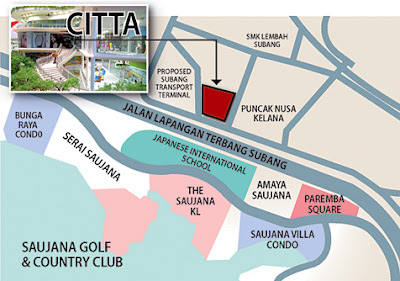 KUALA LUMPUR : Citta, the newly constructed suburban mall in Ara Damansara, has been put up for sale by the owners, sources say. "The vendor is already in talks with interested parties," a source told Business Times. The Citta Strip Mall - 70 per cent owned by German real estate fund SEB Asset Management and 30 per cent by property developer Puncakdana Group - is said to be looking at raking between RM700 per sq ft and RM800 per sq ft. This open air shopping mall has some 424,467 sq ft of nett lettable space which means that the mall may fetch as high as RM340 million. Previous reports said the mall was built at a cost of RM280 million. CB Richard Ellis (CBRE) Malaysia's managing director, Allan Soo, when contacted to confirm the sale, declined to comment. CBRE has been involved in the leasing of the property and prior to CB Richard Ellis Group, Inc signing on Regroup as its affiliate, the latter was involved in the design and concept of the mall. Regroup was also instrumental in bringing in SEB as an investor into the retail project. It is understood that CBRE is now handling the sale of Citta. A deal may be concluded as early as by the end of 2011. This sale, should it be completed by the year-end, would make it possibly the tenth transaction of a retail asset in Malaysia. In recent months, there have been purchases of the East Coast Mall, Gurney Plaza extension, Klang Parade, Ipoh Parade and Seremban Parade. Citta, which opened for business in April 2011, is currently 40 per cent occupied. The mall covers three floors, excluding the basement and rooftop over 800 car park bays. Tenants in the mall include Harvey Norman, MBO cinema, Pappa Rich, Chili's, Julia Gabriel, RakuZen and Anjappar Restaurant.